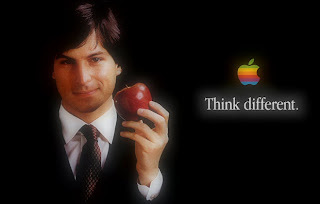 Steve Jobs changed the way in which we all interact with technology. I got my 1st computer in 1982. It was a Commodore 64 computer. Most of the functionality was text based as there was no concept of drag and drop. I took my 1st computer class in high school in 1984. We learned on IBM XT computers running MS DOS. Even though I've never been a huge fan of Apple, I respect the game and the ingenuity required to take bold steps and change conventional thinking. The Macintosh computer was a bold step. The boldness is reflected in this Apple Superbowl Ad from 1984. Before the Macintosh computer we were subject to typing commands from a DOS screen. If I wanted to look at a large number of Microsoft Word files in a folder and see the file sizes I would type the following from a DOC command prompt "dir *.doc /c /p". Now we simply double click 1 icon. We Steve Jobs was ousted from Apple in the early 90s, Apple ceased to innovate. 1) Steve Jobs didn't invent the computer but he made it easy to use and fun. Windows, Linux and every other operating system has copied Apple's concept. 2) Steve Jobs didn't invent music or MP3 technology, but he made practical to carry thousands of songs in our pocket. Sony, Zune and every other MP3 player has copied Apple's model. 3) Steve Jobs didn't invent the mobile phone, but he combined different technologies into a smart phone that had never been done before. Android, Blackberry and Microsoft are trying to may catch up. 4) Steve Jobs didn't invent the tablet computer but he created a demand that has yet to see its full potential. Amazon, Motorola, Acer, Dell are trying to play catch up. 30 years of amazing technology. Steve Jobs' legacy can't be compared to anyone else. He changed not only the digital world, but also the whole wide world. He's really great at what he does. Very nice article I really like it,,,well u can also take a view n review over here..